In general, I am opposed to the sort of pranks that have become all too common in the tech and business worlds on April Fools' Day. Most just aren't that funny. But, but but: A number of people pointed to a larger truth amid all the messages: Why is it that April Fools' Day is the one day a year where we view what we read on the internet with skepticism? The first was Snapchat's epic dig at rival Facebook — a photo filter that turned selfies into what appears to be a half Russian Facebook page. 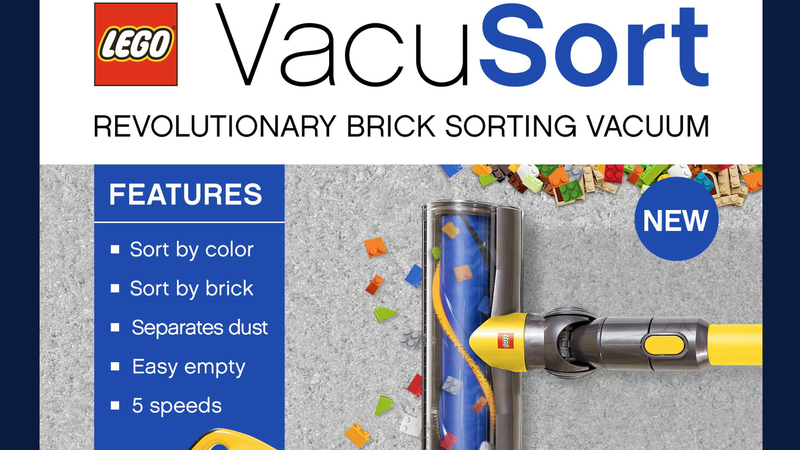 The other was a fake product from Lego that I think many parents would gladly pay for: A vacuum capable of sucking up and then sorting the little plastic bricks. More: This year's list of unfunny antics included Rent the Runway expanding to clothes for dogs, streaming socks from Roku and Elon Musk joke-tweeting about going bankrupt. If you're really into these sorts of pranks, there's a compendium of such antics here. "You know, I find that argument, that if you’re not paying that somehow we can’t care about you, to be extremely glib. And not at all aligned with the truth. The reality here is that if you want to build a service that helps connect everyone in the world, then there are a lot of people who can’t afford to pay. And therefore, as with a lot of media, having an advertising-supported model is the only rational model that can support building this service to reach people...I don’t think at all that that means that we don’t care about people. To the contrary, I think it’s important that we don’t all get Stockholm Syndrome and let the companies that work hard to charge you more convince you that they actually care more about you. Because that sounds ridiculous to me." The other side: His comments, part of a podcast being released Monday, come as Apple CEO Tim Cook continues to voice criticism of Zuckerberg and Facebook, saying that no company should have that much information on your history and that Apple would never find itself in the same situation as Facebook. As we've been pointing out, Cook and Zuckerberg have been trading shots over privacy since at least 2015. It's well known that Sinclair Broadcast Group makes its 200-plus local stations air centrally drafted opinion items reflecting its conservative, often pro-Trump positions. But to really see the full impact, you have to see those scripted efforts side by side. And Deadspin did just that. Watch: The website made a video showing the pieces all mashed together, with stations across the country having their well-known local on-air personalities decry the travesty of fake news. Why it matters: Sinclair is in the process of trying to buy Tribune, a controversial deal that would further concentrate local media and greatly expand Sinclair's reach. The power of video: CNN reported on the forced editorials last month but it wasn't until Deadspin's video that things went viral. What’s next: Sinclair is currently negotiating with the FCC and DOJ to get them to sign off on the deal. If the Tribune deal were allowed without any divestitures, Sinclair would reach over 70% U.S. households, which would be an unprecedented level of access. With Tax Day just two weeks away, there are still a lot of unanswered questions for those who have gains (or losses) to report from investments in cryptocurrencies, Kia Kokalitcheva reports. The bottom line: Yes, you need to pay taxes on crypto investments. But exactly what you owe on such gains is tricky, especially given the limited guidance from the IRS. How popular is the game Fortnite? Well, the game's maker just had to add a warning reminding school kids not to play in class. As we highlighted in Login, the game was the talk of the recent Game Developers Conference in San Francisco and has been topping the mobile charts. Yes, but: Popular though it is, Fortnite is not actually addictive, at least according to one researcher, BBC reports. The Global Game Conference takes place in Beijing. China's Space Station returned to Earth, GeekWire writes, with U.S. and Chinese officials saying any debris from the destroyed space lab would have safely fallen into the Pacific Ocean. GeekWire also has a look at the last remaining Blockbuster Video store in the continental U.S. It's in Bend, Ore., in case you were wondering. Six other locations remain open in Alaska. Ticketmaster is denying a New York Times report it is stifling competition in the concert industry, per Bloomberg. Missouri's Attorney General has opened an investigation into Facebook's data practices, Bloomberg reports. Leading economists are increasingly scaling back the most apocalyptic forecasts of job losses resulting from the new age of automation — only 10% of U.S. jobs are at high risk of vanishing to automation, per a major OECD report. Congratulations to Notre Dame, which won the NCAA women's basketball tournament on a last-second shot by Arike Ogunbowale.